Google Lat Long: What's interesting around here? Since the launch of our map-creation tools, we've seen some fantastic content created by people around the world, ranging from places to visit in Kyoto to isolated populations in Western Europe to photos of Americana. We wanted to share these maps with you, so we created a Mapplet for browsing popular user-created maps. This makes it easy to find public maps created by other users via the My Maps tab. 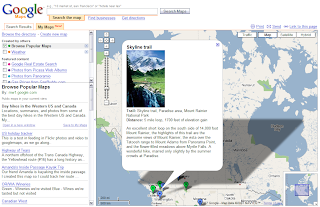 Pan the map to your favorite destination, and you'll see some user-created maps for that area on the left-hand side of the screen. Use the Mapplet to find interesting things to do on your vacation, read stories from people on other continents, or broadcast your own views. If you find something you really like, you can click "Save to My Maps" and it will be added to your My Maps tab.